An Ice Skating Experience Like No Other! MGM Springfield is excited to debut Fantasy Skate Programming at the Ice Rink at MGM Plaza presented by Mercedes-Benz of Springfield. This exclusive program by Chill Entertainment features professional entertainment, a Fantasy Skate Camp, group skating lessons and private instruction lead by members of the entertainment cast. 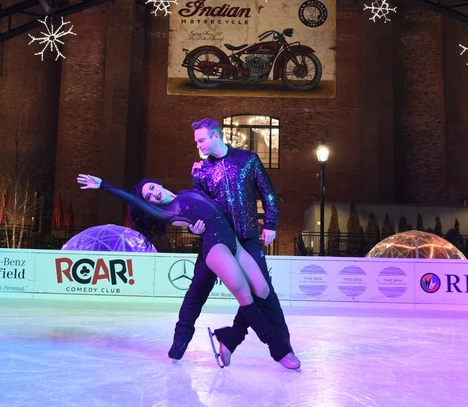 Each weekend, guests of MGM Springfield and skaters can enjoy free professional skating entertainment Friday, Saturday and Sunday at 4:45 p.m., and 7:45 p.m. featuring an all-American cast of professional skaters currently performing on the international professional tour circuit. Fantasy Skate Camps are open to ages 13 to 18+ who have skating skills and who dream of being a skating star. This unique opportunity will transform the everyday skater into a skating star for a day and include the chance to perform with the cast in an evening performance. For those looking for more personalized experience, guests can reserve a personal lesson with a professional cast member, any time they are scheduled on site. Traditional group lessons are scheduled at 11:00 a.m. on Saturday and Sunday for ages 4-13 years old.